Powell, Trachtman, Logan, Carrle & Lombardo P.C. 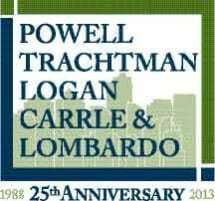 Powell, Trachtman, Logan, Carrle & Lombardo, P.C. is a full service law firm that represents businesses and business people in matters such as litigation and dispute resolution; business planning and transactions; employment law; architectural, engineering, and construction projects; real estate leasing and development; estate and tax planning; administrative and environmental law; and information technology and e-commerce. The firm was formed in 1988, by attorneys who believed that the accepted model of what law firms do and how they do it needed to be re-engineered, for the simple reason that legal services as they were typically delivered were not consistently adding value to the business clients being served. Owing to its unique approach to client service, Powell, Trachtman has been recognized as one of the fastest growing and most successful firms in the region. Our clients include large, small, start-up and mature companies engaged in a wide variety of enterprises, such as architectural, engineering and other design professional firms, manufacturing facilities, technology and internet-based businesses, service companies, health care entities, development and construction companies, financial institutions, and many others.